Part of the 30-Day Challenge, Day 7. I have a toddler. I don’t go to the movies. At least, not often. And honestly, I prefer binge-watching “Parks and Recreation,” or whatever our latest show of preference happens to be, on the glory that is Netflix…and I can stay on my couch, snuggle with my wife, and not have to get a babysitter. That said, I thought I’d use this post to make some recommendations–because once in a while I AM in the mood for a movie (especially if it’s available on Netflix!) So here are my favorites in a few categories, all available on Netflix. Stardust – Action/Adventure/Fantasy. Hard not to love a movie based on a novel by Neil Gaiman. And while I’m generally skeptical of book-to-movie adaptations (ahem, Ella Enchanted) this one stands as an enjoyable movie in its own right. In an attempt to win the heart of the girl he thinks is his true love, Tristan crosses the boundary from his ordinary world into a magical realm where a fallen star has taken human form–and in the process, discovers his destiny. 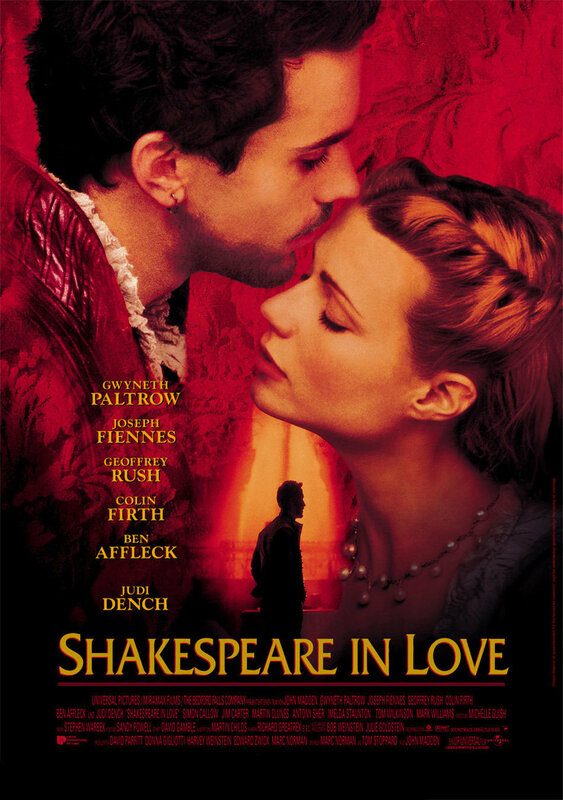 Shakespeare in Love – Drama/Comedy/Romance. Yes, drama and comedy, though the comedy is really best appreciated if you’re a big Shakespeare nerd (like me). But even if you don’t know Shakespeare well, if you’re a fan of romance and period pieces, this fictional (emphasis on fictional) account of the Bard’s early career and the love that inspires him to write Romeo and Juliet will satisfy for a date night on the couch. Being Elmo – Documentary. I love documentaries, so it was hard to pick just one to recommend here. But I’ll go with this one, because it’s compelling, insightful and entertaining. It follows the career of Kevin Clash, the puppeteer who made Elmo a star. After the documentary came out, Clash did run into some personal scandal, but the accusations against him were proven to be false. This documentary is a fascinating look at the behind-the-scenes world of the Muppets and Sesame Street, as well as how a boy with the odds stacked against him somehow became a star. Clueless – Comedy. I’m generally not a comedy person, but this is one I’ll always watch. I think it’s mostly that it’s just SO ’90’s and defines my early teenage years. But I’m also a sucker for a clever adaptation of classic literature (it’s based on the Jane Austen novel Emma, for those note in the know). In fact, I recently discovered that my wife had never seen this movie, despite also being a teen girl of the 1990’s. I promptly forced her to sit down on the couch and watch. So, next time the kids are in bed and you’re in the mood for a couch date, pop the corn and fire up Netflix. Way cheaper and less crowded than a movie theater–and you won’t have to pay the babysitter. Being Elmo is fantastic! I second that recommendation. And Clueless!? AS IF that wouldn’t have made this list! Total Classic…my friends and I quote it all the time!